Forever Motown– Direct from New York – The Original Cast of FOREVER MOTOWN! Nine all-star performers featuring G.C. Cameron, Original Lead Singer of THE SPINNERS and Glenn Leonard, former Lead Singer of THE TEMPTATIONS. 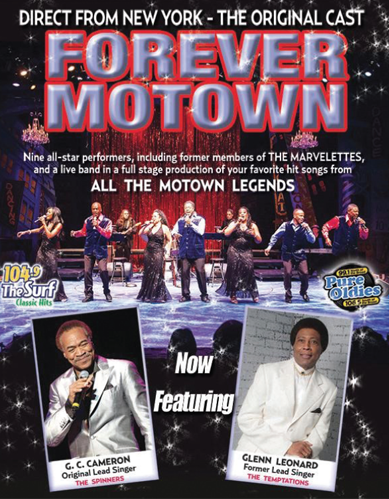 With former members of THE MARVELETTES and an All-Star live band, this is a full stage production of your favorite hit songs from ALL THE MOTOWN LEGENDS.